It’s Christmas, so along with the green ‘Kiss the Cook’ apron you normally wear, you’ve managed to attach mistletoe to yourself in various places. Rosy red cheeks and a blouse to match are stylishly offset by the prized wooden spoon you permanently carry around. I’m Perky Baster, Mr LeGrinch’s cook - well, I say Mr LeGrinch’s cook but really I’ll cook for everyone and anyone. They all love my nice warm pies, fresh from the oven - or maybe a nice bit of bird. And look at me, all covered in tinsel and flour, what must you think of me! And where are my manners? 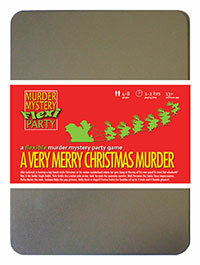 Mr LeGrinch’s murder has given me a terrible shock. Would anyone like a mince pie?